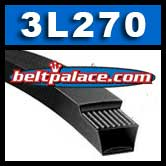 3L270 FHP V-Belt. 3/8" x 27" Overall Length. Consumer Brand. Can replace Harbor Freight metal cutting band saw belt 3V x 270 (3V270).